Builders from across India will display their new launches in Property Exhibition which will be held in Kuwait on January 11 and 12. The builders hope to find some NRI customers. 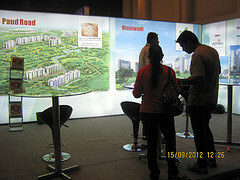 Property Exhibition: The platform for NRIs to gain firsthand information. Indian Property Exhibition will be held at Ramada Hotel in Al Rigga, Kuwait. The exhibition will be opened for the visitors from morning 10.45 am to evening 8.30 pm. This is the 23rd Indian Property Exhibition held in Kuwait.